The history of technology is often troubled by good ideas that do not, for one reason or another, take off right away--sometimes for millennia. Sometimes, technology comes to a standstill, and sometimes, it even reverses itself. Thus, unlike science, which seems to proceed at a reasonable and calm rate, the progress of technology is difficult to theorize about. While in science many developments are predictable to a certain extent and this predictability may, at times, direct or stymie science's progress--as with stem-cell research and cloning--technological advances, such as the Internet, are often sudden and unpredictable, and therefore frightening. 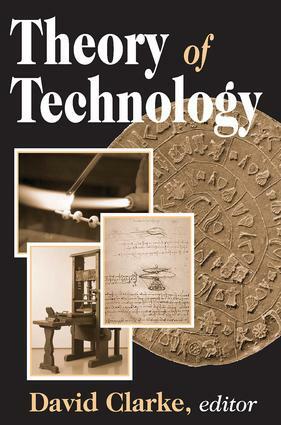 In Theory of Technology, David Clarke brings together nine authors who try to understand technology from a variety of viewpoints. Rias van Wyk, in "Technology," parses the concept into many angles, including its anatomy, taxonomy, and evolution. Karol Pelc, in "Knowledge Mapping," discusses tracking the evolution of the emerging discipline of technology management. Jon Beard, in "Management of Technology," pursues a similar mapping endeavor, but looks to the patterns of the literature of technology management. Thomas Clarke, in "Unique Features of an R&D Work Environment and Research Scientists and Engineers," takes the reader on a tour of how people of technology present unique challenges to not just management but whole organizations.